This simple device really works wonders. I have a Bench Dog Cast Iron wing extension router table (the pic above is not my set up) and thought I was getting decent chip collection through the fence but this $40 gizmo makes DC’ing at the router table an art. -a sheet of plastic that you need to attach between your router and plate. Easy enough for me to do but if you have a complex lift it might give you headaches. Like I mentioned earlier, it went on pretty easy, about 30 minutes of work. You need to unmount your router and then place this plastic sheet between it and the plate. The opening in the plastic where the bit comes though is surrounded by velcro and the blue “cup” adheres to this. You then sandwich everything back together and put it back in the table. You hook one hose onto the fence and the other into the “cup”. Attach your vac of choice and you are up and running. In a word—amazingly. I was originally running it with my Rigid shop vac and it was doing a nice job, but when I put a step-down adapter on my 4” dust collector hose this thing must have sucked up 98% + of of everything that came off the bit. I routed about 30 bf of round overs with it and there was literally no debris on the table or underneath, no dust in the air—absolutely great. Since it creates suction from above/behind and below the work piece it get it all. The magic is in the cup. Since it is essentially sealed (sort of) around the bit and to the plate there is no where for anything to go. In the long run this has to be much healthier for your router motor as well. Since the “cup” is silicone you can squash it to do above the table changes or you can pop the Velcro off and do below table if you r prefer. I did talk to a guy who had a hard time with it in his lift (I think he had a Jessem). Since I am using it with a table saw wing extension I do have to take it on and off all the time—this is not a shortfall of the equipment, just a by-product of my set-up. Likewise, since it is made to go behind the router table I wish the hoses were a little longer to go around the side more easily. So, I will be buying longer tubing-no biggie. Knowing how well it works and how much junk it is saving my lungs from, even if it was pricier I would still buy it. I really think the magic is in the proximity of the suction to the bit and top of the plate. It is something you just can’t get with a box with a hose in it. Highly recommended. A no-brainer. To make it sweeter I was able to pick mine up at Woodcraft for $34.00 during their last sale. what did you get for 34 dollars just to boot or the whole hose set up? Based on your review I researched this collector and liked what I saw. 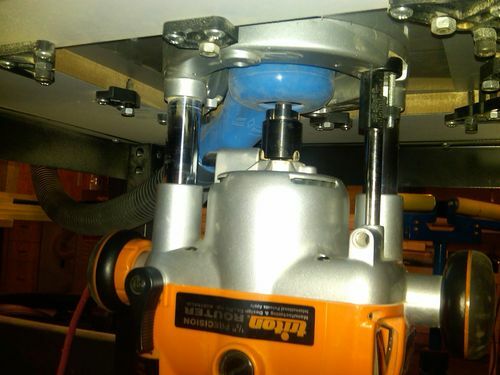 I have a 3.5hp Triton dedicated to the router table. I sent an email to the company to ask if anybody had issues with the Triton, they replied promptly and said no, but if it did not work to send it back for a full refund. Well I installed it today. I had to remove the plastic dust control housing from the router. The base of the router is thick but the velcro on the top of the cup was able to compensate. I already had a hose connected to the fence and dust port on the router so all I really needed was the cup and matching plate. The hoses provided were too short for me anyhow. Above table bit changes are fine with the cup installed on my Jessem table. I chucked a 1/2” straight bit , turned on the DC and ran a chamfer. WOW! NO dust or chips anywhere! Next I tried a dado, a few small chips came out on the table at the beginning of the cut and everything else was sucked up. Some of the initial chips were sucked back through the freshly cut dado as I pushed it through. Glad you guys have found it to work well thus far. I continue to be happy with mine. Thedude: How did you get them to send you a free one? That is nuts! I see Dude is planning a review of the product and has already tested it out. I was planning on building a special dust cabinet under the table which would involve sucking dust down across the router in addition to having to open a door to access the router every time I wanted to do a bit change. With a dedicated Triton under the table there is really no need for a lift or collection box. This weekend I had to do some modifications on my mini cyclone setup because the router was overwhelming it due to the increased amount of chips going through it. Before, I had a bunch of those chips ending up on the floor and the CV mini had no problems with the 60-75% it was able to pull through the fence and somewhat dis-functional collector shroud around the bit. Now it gets over 98% or better. Thanks for finding this tool for me I do appreciate it. Also I used it for a few hours yesterday now all i need is to get a bunch of dust collection hose to fix the far side of the shop into the central dust collection site. I have it hooked-up to my biggest shop vacuum for now which i don’t like doing I need a lot more hose to get her done. Looks good Tech you help make my point a bigger router with variable speed and soft start is a must in a router table . I believe your router has a built in lift right I had to add the router razor to my beast and am very happy with the results I was able to get with the raizer and while it is a modification i only use this router in the table I have 19 other routers to play with and don’t need to pull this one out at all I am a little spoiled on the tool front I need a new Table saw though. Just wanted to through my $0.20 in on this Keen system. Deciding I needed to ad dust collection to my shop for a variety of reasons, I was having a hard time deciding how to address the router table. Found a few reviews on the Keen product and decided for such a small purchase price it was worth a shot. Anyway, got it setup last week and ran some MDF on it to build some axillary fences and jigs. I am thoroughly satisfied with this product. 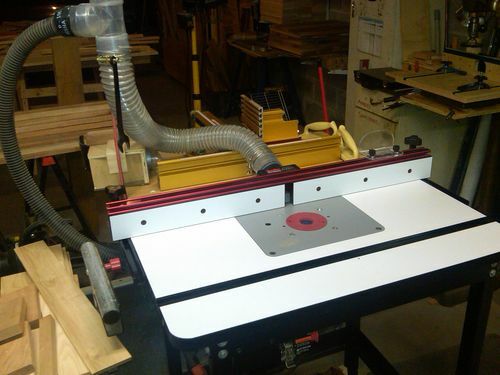 Running a variety of depths of straight cuts, there was virtually no saw dust on the surface of the router table or floor. When I ran a t-channel cut bit, because of the direction dust ejection, the Keen system did not do as well picking it up, but still caught quite a bit. I have it hooked up to a shopvac with HEPA filter for DC as a portable system. It looks like the Keen company has gone out of business. Their web-site URL is available to buy. Hey, fwiw, I just picked up one of these from Amazon. I’ve got it mounted in a Jessem Rout-r-lift 2 in a kreg router table. Works quite nicely. The tedious part was disassembling the lift in order to mount the acetate sheet that has a velcro ring. The velcro ring helps hold the cup tight under the table. The hard part was cutting neat curves around the collars for the lift posts. No trouble at all lifting the router up enough get to the collet nuts with just the regular flat wrenches. Mine’s fed into a Festool CT26 using hoses for their CMS router. I’m not using the supplied hoses or fittings at all as the Festool ones manage to fit. I went with those to get a better flow on the Y fitting instead of the supplied tee. Anyway, once installed it works GREAT! Absolutely NO leaked dust, even when cutting MDF and hardboard. It’s been a number of years since I installed mine, still working great. If you can find one of these, I would get it.